Thanks to: Robert Philip, Joe Brennan and specially thanks to Stephanie Thorburn and of course David English. avid English has been a true friend of Barry and Linda Gibb for many years already and together with Barry, Robin and Maurice he has been involved in very interesting projects through the years. From music to charity, from film to cartoon books and cricket matches etc. etc. David comes from Hendon (North London) coincidentally where the Gibb's first lived when they arrived from Australia. He's married to Robyn and they have two kids named: Amie Rose and David Junior. If you'd like to join David: "The Loon" while he talks about his life and all his adventures than the best thing to do is reading his biography book: "Mad Dogs & The Englishman". It contains lovely stories about so many people he has met in his life I've chosen some small parts of the book for this article to publish and hopefully it'll interest you to read his complete biography, it's really worthwhile and learns you also much more about his special relationship with the Gibb Family. Some quotes from: "Mad Dogs & The Englishman"
David about life: Every day I wake up enthusiastic, wanting to help others. To entertain them, to fulfill their dreams. I have always believed that fantasy can become reality. David about meeting Barry Gibb for the first time: My first personal encounter happened on a late afternoon in 1971. There was a bit of a commotion in the street below. I nipped downstairs to find Barry and his wife Linda standing next to a Rover Saloon. 'What happened here?' I enquired. 'I'm not sure', said Barry 'It could be the battery'. 'Let me see what I can do. By the way my name is David English.' 'Barry Gibb, nice to meet you,' came the exchange. Hands were shaken, banter and laughter ensued. The battery was forgotten. Little did we know what adventures had just begun. David about starting RSO: 'You're the one' Robert Stigwood said, 'I've decided to start my own record company, and you are making it the greatest in the world!'.... 'What logo would you suggest for the label' Robert continued later on in the conversation with David. It was the year of the Red Cow in Japan and David replied: 'What about a Red Cow ? It's lucky in Japan!' On 1 January 1973 I started RSO Records. Just me and the Red Cow. I was 27 years old. On my door it said: D.S. English - President. David about his first meeting with The Bee Gees: First in the door was Maurice, laughing and joking, Robin arrived with his wife Molly and personal assistant Ray, ten minutes later Barry walked in, wearing a fur coat with Linda by his side.... A lifetime friendship there was born under the chandeliers of 46 Brook Street. We've been working and laughing ever since. A Bridge Too Far (released 1977) with David as Pvt. Andrews. Written by Cornelius Ryan, directed by Richard Attenborough. avid wrote an interesting report in his book about all his activities and adventures during the filming of this movie. His 23 weeks of living in Holland. To me this was very special to read. Being born in Arnhem and still living near that famous Bridge Too Far I grew up with remembering this part in Dutch history very intensely as each year in September, since war ended, we remember all the foreign soldiers who gave their lives for our Dutch freedom. This is done in different ceremonies held in and around the city of Arnhem. How he and Barry decided to make the film 'Goin Dutch' which later on was named: 'Hawks'. David's love for The Gibb Family and his own family. The story of his marriage where Barry sang for him as a surprise. And last but not least his love for cricket and The Bunbury Team and the interesting Bunbury music project with Barry and brothers Robin and Maurice together with some other celebrities. don't know whether you find Sir Cliff Richard's singing insipid or inspiring but since his latest offering, Somethin' Is Goin' On, reached No 7 in the pop charts, obviously someone, somewhere likes the sixty-something crooner. But it is the `B' side of his 118th Top 40 single (and if you can name them all then you really need to get out more) to which I wish to draw your attention because the credit - or blame - belongs to my old mucker David English, who penned How Many Sleeps? in collaboration with Bee-Gee Barry Gibb. I was fully cognisant of David's previous and various claims to fame, of which I will list but a few: As a humanitarian he was awarded the MBE this year for raising more than £7 million for charity through the Bunbury Celebrity Cricket Club which he founded (of the England squad that defeated the West Indies this summer, only Andrew Strauss had not played as a youth in the annual Bunbury Under-15 Schools Festival). As president of RSO records and manager of Eric Clapton and the Brothers Gibb, his label once enjoyed the unprecedented success of having five Top 10 records in the US Billboard chart in the same week. As an actor, he starred alongside Laurence Olivier, Anthony Hopkins, Sean Connery, Gene Hackman, Michael Caine and Dirk Bogarde (explaining the mysteries of cricket to Robert Redford between filming) in A Bridge Too Far. He was also outstanding in the role of a corpse in Z Cars and as a man with very clean hair in a Head and Shoulders advert which ran for five years. ut of his talents as a songwriter I had been hitherto blissfully ignorant. "I wrote it for my daughter Amy Rose who, as a little girl, used to phone me from Zimbabwe where she lived, ending every call with the question, `How many sleeps before I see you again, Daddy'?" (On a personal note, no dad who lives apart from his young children will be able to listen to lines such as, `I kiss you each night, I promise to write and I'll see you very soon', without shedding buckets). Nor, I have now discovered, was this David's first venture into the world of Lennon and McCartney. "I wrote a reggae number for Elton John, an Indian-style song for George Harrison who brought along Ravi Shankar to record a sitar solo and a couple for the Bee-Gees which will all be released on a special Bunbury CD, plus a single for Eric Clapton which has already been No 1 in an American rock chart. Now Barry Gibb has asked me to help him on Barbra Streisand's next album." Just what the serious-minded Babs will make of someone Ian Botham describes as "a lunatic - the funniest man I've ever met", remains to be seen. David received another honour in recent days when he was presented with the Lifetime Achievement Award at the climax of the Cricket Board of England and Wales' OSCA (Outstanding Achievement in Cricket) ceremony at Lord's having delivered a typically fall-about, 45-minute after-dinner speech. "You normally expect to see Tom Hanks or Mel Gibson up there at the end of such occasions, instead of which they got this old geezer." Knowing the man, a Grammy must surely awaits. The Bunburys is the name of David's cricket team but specially amongst the fans the name is known for the cartoon books and the additional musical project David worked on together with Barry, Robin, Maurice and other well known artists. Joe Brennan: Barry's Bunburys project is one of the most confusing in all the Bee Gees discography, and spans six years, from the first single in summer 1986 to the CD collection The Bunbury tails in 1992. An integral part of the project was a series of cartoons written by David English and drawn by Jan Brychta, the team who did the Bee Gees pictorial biography The legend in 1983. The two also did the 9-page story books that accompanied the two singles "We're the Bunburys" and "Fight". In the 1986 story, a cricket team of rabbits makes the recording. In the 1988 story, the rabbits help train a fighter. Animated cartoons of the Bunburys rabbits were shown in the UK. The project promoted the playing of cricket and general good sportsmanship. According to the notes in The Bunbury tails, English and Brychta were inspired with the idea while watching a cricket game and contacted Barry at his English home, and Barry wrote "We're the Bunburys" with English and recorded it in Miami. The B side of the first single, "Chapter one", is David English telling the story from the book that accompanies the single (with slight variations from the printed text), and it includes excerpts of the song "We're the Bunburys" and some other spoken vocals including Barry. "We're the Bunburys" was credited only as the Bunburys on the single, but as the Bee Gees The Bunbury tails.The second single, "Fight (no matter how long)" (with variations on the title in different appearances), was recorded in August 1986 according to an Eric Clapton discography, and at David Mackay's studio in Woldingham, Surrey, England according to the notes in The Bunbury tails. It is said to have been "remixed" in 1988. Obviously featuring Eric Clapton on lead vocal and guitar, it also was credited only as the Bunburys until it appeared as Eric Clapton on The Bunbury tails. Its first appearance was on One moment in time, the NBC Summer Olympics album, and then it appeared on an English single with book, with "We're the Bunburys" as the B side. It also appeared as a single in the US and Germany with an instrumental version on the back No Hat Moon's "Seasons" was recorded the day after "Fight" at the same studio, according to the notes in The Bunbury tails. The four singers' surnames are not given, and their only other records seem to be two UK singles in 1986. The single "Seasons" did credit No Hat Moon by name instead of the Bunburys, but the B side was once again "We're the Bunburys" in its third appearance on a single. The date of the "Bunbury afternoon" recording is not stated, and it may be later than 1986 even though the song itself is from this time. "Up the revolution" was recorded by Elton John for the Bunburys project in 1988, but there is a cassette demo by somebody from the September 1986 copyright filing, either the Bee Gees or Errol Brown and Hot Chocolate, who were originally slated to perform it for the project. There was an unnamed additional song planned for Shaking Stevens. The songs themselves are excellent and deserve a wider audience than this obscure UK-only release. "Seasons" is a real standout and Barry must be happy with it since he has used the lyrics for his personal Christmas card. (credits Joseph Brennan from his website). his David English / Bunbury report was made in cooperation with Stephanie Thorburn a music journalist from Britain who has been cooperating with GSI more often recently. She has done quite a number of nice reports about David and The Bee Gees in the past. For instance there's the report of Stephanie with David English about his music background which we herewith publish on GSI with Stephanie's permission. 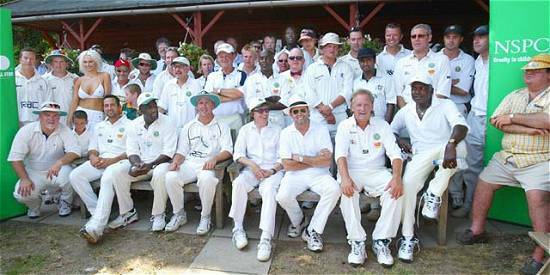 Click here for the story And she also gave permission to publish on our GSI site the new Bunbury 2005 brochure which she recently wrote for the new brochure of the cricket team. 'I did actually speak a few days ago with David English and he is very happy in light of a number of things including the success currently of his single with Barry Gibb and Cliff. He has actually been awarded an 'Outstanding Achievement In Cricket' title a few weeks back too. The history of Barry's working relationship with David is certainly a fruitful area because The Bunbury Tails album includes contributions from not only Barry, but Elton John and Eric Clapton. Please find attached my article for the Bunburys 2005 brochure. This is a preview copy; the feature traces the history of the Bunburys family tree, with plenty of reflection on classic musical moments from Barry's match this year to Rhythm Kings jams. This is really an overview on the project bringing the reader up to date. I know that plenty of fans love the Bunburys project, probably because it encompasses true musical and sporting interests'. A pilgrimage into the roots of The Bunburys. Truth, honour, freedom and all courtesy." Geoffrey Chaucer. iven the current resurgence of interest in The Canterbury Tales, I am genuinely surprised that the directorial experts in the BBC's research team didn't contact our own David English MBE, who could have delivered a few infamous sporting tips to their scriptwriters.. It is said that Chaucer consulted the formative Boccaccio prior to writing his seminal collection of medieval cosmopolitan tales. Before David conceived his Bunbury Tails, he without a doubt transposed in spirit an understanding of the basic elements of Chaucer's genteel Knight. In fact, any disparity between Chaucer and English is only slight. The fundamental sentiments and mores governing The Bunbury's 'pilgrimage' run from interpersonal drama, comedy and commitment, to philanthropy, although pray not polyandry in the spirit the more arresting Chaucerian plots. If the BBC sought to modernise the themes of The Canterbury Tales successfully, then it was because they acknowledge the fact there will always be a currency in collective human action with a common mission. avid English and Eric Clapton masterminded the Bunburys experience some eighteen years ago. It features a cast of some very famous names and distinguished faces. At times the characters are juxtaposed, Sam Fox may make an 'on spec' appearance on the playing field as 'The Wife Of Bath', running riot next to the virtues of Jamie Theakston as our suave 'Knight'. Indeed, each occasion is entirely unpredictable with the cause and name of the Bunburys being irresistible to all. 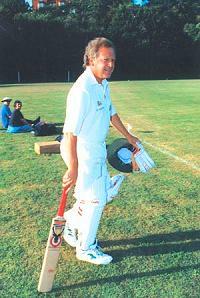 This celebrity family is recognisable in reputation as a cricket club marked out by quality sporting achievement, integrating the parallel worlds of rock and roll, sports and popular entertainment. The angst of love, power, struggle and strife are played out on some familiar wickets at venues forming a Mecca across our English countryside. he reputation of the Bunburys has seen a renaissance in recent years with David English's increasing string of titles and accolades. Few may be aware of the real roots of the Bunbury family tree however. Seeking out the classic 'Bunbury Tails' online, I was swiftly hijacked by a romantic young pretender by the name of Henry William Bunbury, son of 5th Baronet, heir to the estate of Mildenhall, (1750-1811)*. This enchanting real life biography is touched with uncanny facts and metaphorical correspondence. Henry William's second home being Barton Hall, like the seminal impresario Robert Stigwood, he was a satirist and groom of the Bedchamber to the son of George III. On surpassing puberty, he married Katharine Horneck who became a favourite of the Duchess of York. Henry's personal traits are that of an eighteenth century new age Bunbury 'lad'. Described by diarist Joseph Farington as "living most of his time a sotting life at Bury in Suffolk;" Henry William's satirical depictions of horsemen and university life were animated works with his piece de resistance definitely being designs for Thomas Macklin's 'The Poet's Gallery'. Nowadays, the Bunburys are more likely to be living the high life exploring the fields of Suffolk on a cricketing plane by Bill Wyman's stately retreat, than reflecting on the social fashions and foibles of our age like dear Henry William. It is glorious to know nevertheless that the Bunburys have a patron of epicurean splendour, who has now been written into their own 'Chaucerian' personal history. This heir to our latter- day Bunbury sports club had substantial ambition too, of the aristocratic variety and was well versed in the practise of free spirit, following his heart to journeys end. or me having been involved with the Bunburys for many years, each match has proven to be an action packed sublime Sunday afternoon of entertainment, featuring plenty of 'tales of the unexpected'. Being a music journalist, not just a cricket lover, every season is filled with opportunism and unrepeatable situations (and quotes) from a cast of the highest calibre. Oscillating classics from soggy sock jams at Blenheim Palace, Woodstock with Bill Wyman's formative Rhythm Kings, to scorching afternoons in the paradise of tropical 100 degree heat last year as Eric Clapton touched base back on his home turf of Ripley, Surrey, all the memories I have of fixtures are priceless. Definitely the regal highlight of the 2004 season was Barry Gibb's appearance at Imber Court, Surrey, supporting David his best friend and writing partner, fresh from Buckingham Palace, having just collected his CBE... On researching for this piece, I noted the suggestion that The Travelling Wilburys may have been titled after George Harrison recorded with David English. This shows the capacity he has to inspire and excite a spirit of odyssey and performance into the most gracious. think the disciplines of sport and music form a natural 'marriage group'; the Bunbury Tales are though, more a match made in heaven because at times they are too surreal.. Many congratulations to Dr David English MBE on his most recent accolade, an 'Outstanding Achievement in Cricket' award. This is perhaps the accomplishment you have grafted hardest for, considering the diversity of your work not only within show business, but more importantly for maintaining the bricks, mortar and heritage of our eccentric national sport. * With thanks to Moira Bonn for her educational web page on the Bunbury's legendary family tree. Henry Bunbury integrating poetic parody & visual humour in Romantic verse. - A highbrow must for the Bunbury's growing merchandise stall! and of course David English.